If your holiday menu includes a Whole Foods organic turkey and locally-grown greens served on a hand-hewn table covered with a vintage table cloth, this is the centerpiece for you. 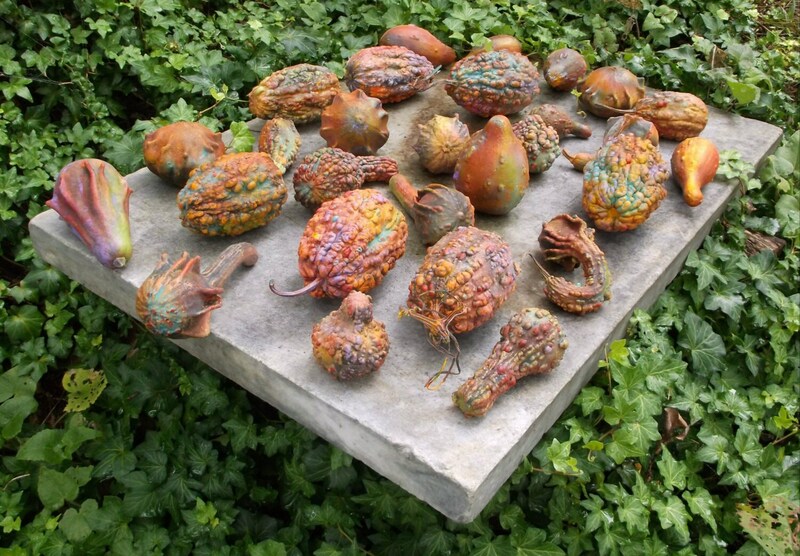 The 28 ornamental gourds are from my private stash. I've had these ornamentals for years. They're dry as the Volstead, cured to perfection. 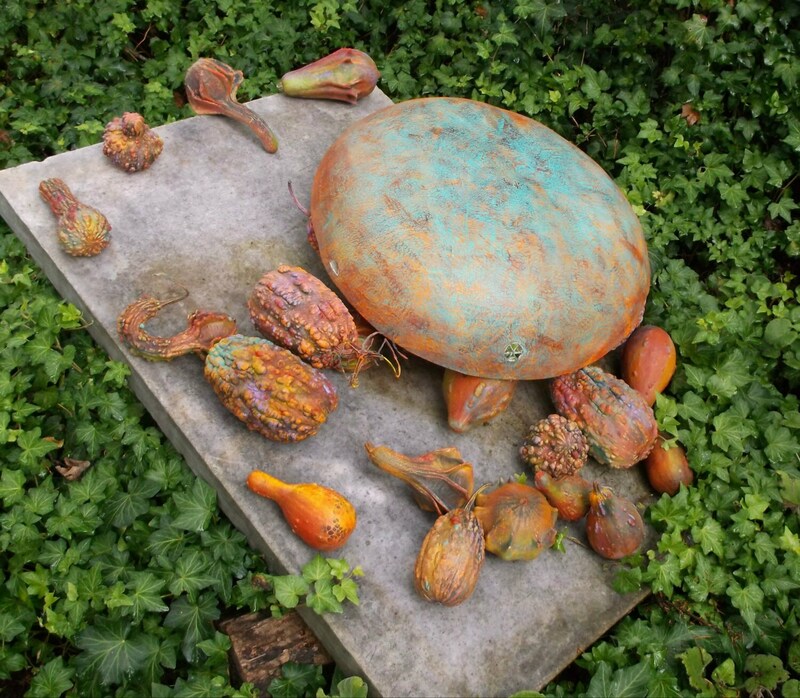 Each gourd's fabulously textured landscape is hand-painted, each nook, cranny, bump highlighted in fall and jewel colors. The ornamentals are cozy in a huge gourd bowl. The rim of the bowl is inlaid with mirror bits, and tumbled colored glass placed on edge so when light hits just so, the glass glows warmly. Mirror bits are inlaid here and there around the interior of the bowl and on the outside of the bowl. Inlaid. Not glued on the surface of the gourd, inlaid, a painstaking process that's so worth it. Display all season long. Perfect in an office setting. 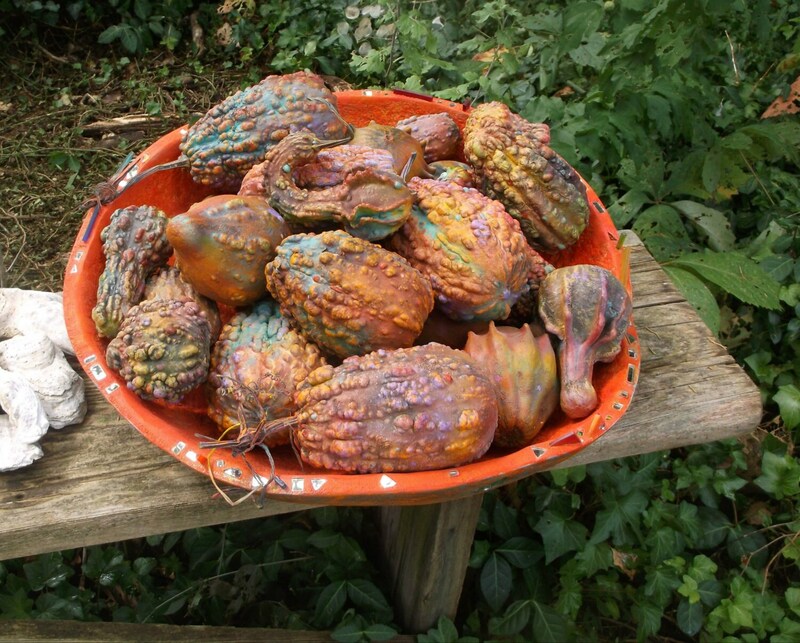 The ornamentals can be stored for future falls, the gourd bowl filled with anything you fancy throughout the year. Twenty-eight ornamental gourds of various sizes and shapes. 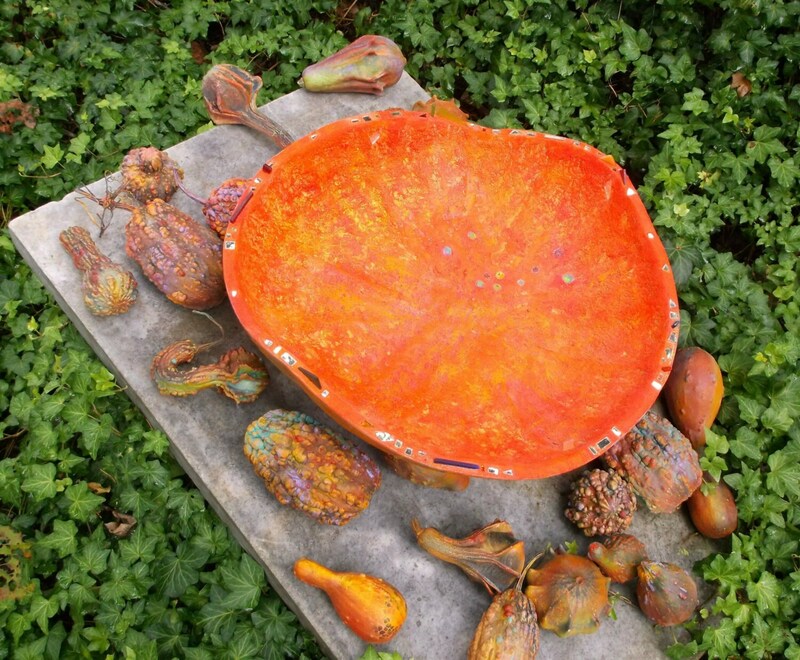 The gourd bowl is beautifully painted and inlaid with mirror bits and tumbled colored glass. The gourd bowl measures 20" across, 5" deep and 59" around. Shipping is going to be pricey. I think around $50. I'll let you know for sure, but wanted to prepare you ahead of time. If you want the 28 ornamentals alone, no bowl: $115 shipping included. 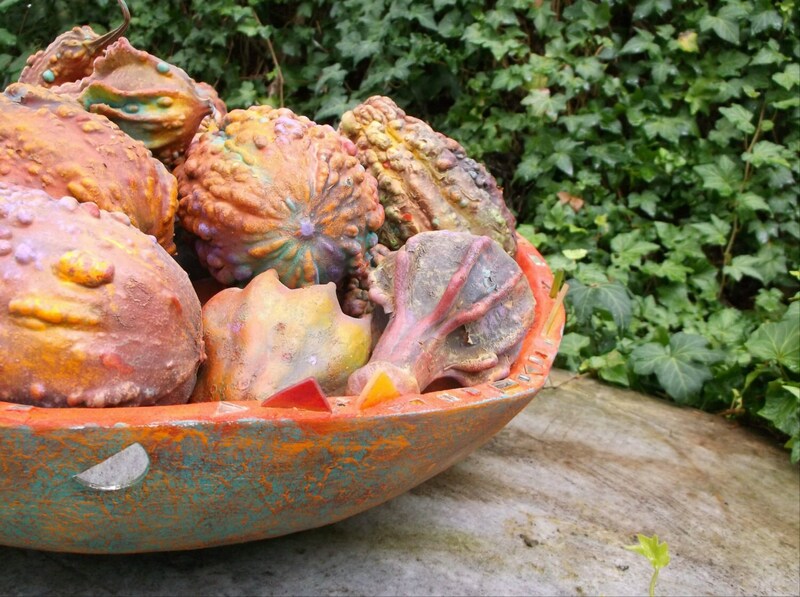 If you want the gourd bowl alone, no ornamentals: $125, shipping not included, probably around $50. Convo me and let me know. I'll prepare you a reserve listing. If this is a gift, let me know that, too. I'll include a hand-painted post-consumer kraft bag with stout handles, some tissue and a gourd sheet chockful of gourd lore and history. No extra charge.